KINSHASA, 30 August 2007 (IRIN) - An epidemic suspected to be haemorrhagic fever has broken out in the Mweka area, about 100km north-west of Kananga, the administrative centre of Kasai Occidental province in the Democratic Republic of Congo, with more than 100 deaths, according to health authorities. The provincial doctor, Jean-Constatin Kanow, said 217 people had contracted the disease, of whom 103 had died, three of them children, since 8 June. According to Kanow, the epidemic affected four villages: Kampungu, Makonono, Kaluamba and Mombo, but it had not been firmly identified yet and it was still progressing. "We suspected a typhoid fever but now we think it is a haemorrhagic fever," said Kanow. Specialists from the World Health Organisation said they were aware of the outbreak but were waiting for the test results, said a WHO doctor, who wished to remain anonymous as only Congolese officials have the prerogative to communicate with the media on the subject. Kanow said the disease was first recognised on 8 June after the death of two village chiefs. "All the people who assisted in the burial of these chiefs have died," he said. About 30,000 people live in the four villages. However, the rest of the population in the Mweka health area are at risk of catching the disease. Two provincial health investigation and intervention teams are visiting the villages. "We have sent a team of doctors and researchers and we are waiting for the results, which will be available after the samples have been examined in laboratories," said the vice-minister of health, Ferdinand Ntua. The provincial authorities have already been taking care of the patients and sent medicines as well as chlorine to disinfect the water. According to Kanow, the disease is spread through contact with sick and infected people. Its first symptoms are fever, vomiting, diarrhoea with blood and dehydration, which lead to the patient's death. "It all happens in five to seven days," said Kanow. 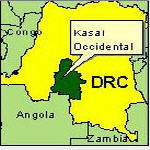 The DRC has already witnessed several epidemics of haemorrhagic fevers. The worst was the Ebola outbreak in 1995 in the city of Kikwit, in Bandundu province, where about 250 people died. Elsewhere, Marburg fever also had devastating consequences last year, notably in Watsa and Durba in Oriental province.